Tea at the Langham Hotel. You may not know how to pronounce it (it’s hoo-ga), but everyone wants it. Unless you’ve been hiding under a rock, you’re probably privy to the hype around “hygge.” The Danish concept of being cozy is sweeping the world, and since Denmark happens to be one of the happiest countries in the world, perhaps they’re onto something. Candles, soft linens, intimate get-togethers, a good book, glowing fireplaces, a walk in the woods . . . these are often associated with hygge. Generally, it’s taking the time to sit back, relax and enjoy the small things in life. But there’s the rub: sitting at home, surrounded by all the things we need to get done, isn’t so conducive to the concept. So, we left the to-do list at home and went hunting for hygge elsewhere, sleuthing out the best warm and fuzzy places in New England. The Boston Athenaeum, one of the oldest private libraries in America (617-227-0270, bostonathenaeum.org), is housed in a handsome neo-Palladian building on Beacon Hill. It’s hushed and gorgeous, with vaulted ceilings, arched windows, and fine artwork, and the perfect place to curl up with a book (and not be disturbed). Of course, members have the best access, including entry into the silent Fifth Floor Reading Room with private alcoves, and the Albert Gordon Newspaper Reading Room. But some of the beautiful space is also open to the public, including the Norma Jean Calderwood Gallery, the Bayard Henry Long Room, and the G. d’Andelot Belin Bow Room. Bring a good book or the daily newspaper and snag a seat in one of the comfy red leather chairs surrounded by historic tomes, original paintings, and sculptures. Anyone is welcome at the Portsmouth Athenaeum (603-431-2538, portsmouthathenaeum.org), home to an impressive collection of rare books and manuscripts. Located in an historic Federal-style brick building across from Market Square, the hushed library has lofty reading rooms and quiet nooks. The Redwood Library and Athenaeum in Newport, R.I., (401-847-0292, redwoodlibrary.org) is also a beauty, with a fine collection of eighteenth- and nineteenth-century paintings, sculpture and furniture. An hour or two spent in its rich and quiet ambiance is guaranteed to leave you feeling serene and rested. When was the last time you carved out two or three hours in the middle of the day to merely sip a spot of tea, nibble on munchies, and enjoy the company of someone dear? Indulgent, indeed! Get yourself to the oh-so-proper (and pleasing) Afternoon Tea with Wedgwood at the Langham Hotel in downtown Boston (617-451-1900, www.langhamhotels.com/en/the-langham/boston/), served in The Reserve, the hotel’s very elegant lobby lounge. 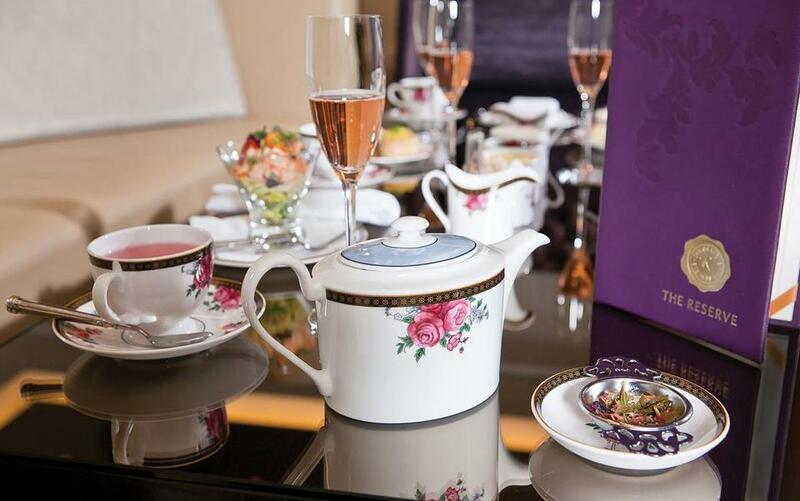 You have a choice of four special teas which are exclusive to Langham and eighteen Wedgwood teas, presented in wooden boxes with descriptive notes and small samples to smell before choosing. Can’t decide? The tea sommelier is happy to make suggestions. Tiny savory tea sandwiches, scones with lemon curd, clotted cream and strawberry preserves, and a selection of seasonal desserts are included. Go ahead, end the indulgence with a glass of bubbly. Harmony and serenity is at the core of the Japanese Tea Ceremony held at the Kaji Aso Studio Institute for the Arts in Boston (617-247-1719, www.kajiasostudio.com, reservations required and there’s often a waiting list). Meander the garden, enjoy the art on display, and think of the good things in life while participating in the traditional ceremony. As Mae West once said, “Too much of a good thing can be wonderful.” We say, if a little hygge is fine, then a whole bunch of hygge can be divine. The folks at the wonderful Camden Harbour Inn (800-236-4266, www.camdenharbourinn.com) get it. Here’s how your overnight stay will go. First, you will be warmly greeted, shown to your room, and invited to come down later for a complimentary glass of Prosecco in the lounge. Your room is a plush oasis, filled with fine art, custom furniture, luxurious linens, soft feather beds, and all the modern, high-tech bells and whistles. Many of the rooms have fireplaces, soaking tubs and steam showers. Some have private decks and water views. Our favorite splurge is the Royal Dutch Suite, with a separate living area, two gas fireplaces, several flat screen TVs, and a bathroom that is bigger than either of our first apartments, complete with a soaking tub, steam shower and private sauna. You will finally make yourself leave the room to enjoy that glass of bubbly, perhaps, in front of the lobby fireplace. Dinner at award-winning Natalie’s, on-site, is a must; it’s considered one of the finest in the region, serving three- and seven-course prix fixe menus, as well as a lobster tasting menu. Your stay ends the following morning with champagne breakfast (try the lobster benedict! ), included in the rate. The Kimpton Taconic in Manchester, Vermont (www.taconichotel.com), is your home away from home, with a slew of hygge-inducing amenities. Grab a complimentary cup of coffee or tea in the morning to enjoy next to the lobby fireplace. Return later for the free evening cocktail reception, before dinner in the warm and cozy Copper Grouse. The on-site restaurant, with wood beams, plank flooring and soft lighting, serves up contemporary comfort food, like butternut squash bisque, tea-crusted pork tenderloin and cider-brined chicken. The resort even offers seasonal hygge kits to use during your stay. During cooler months, the kit included local goodies like Icy Palmer’s Nordic White candles, Silly Cow Farms hot chocolate, and a pair of Darn Tough socks. Other hygge kits might have fly tying supplies, packets of elderflower seeds with a cordial recipe, and local Vermont preserves and cheeses.